NOTE Just to clarify. This is not adding the ability to open ArcGIS .lyr files. One of the reasons that I love working and being part of the QGIS project is how quickly you can take it from not having a needed feature to having said feature. A good example of this is a recent addition I added related to having a ArcGIS .lyr like feature. For those who don’t use Arc, the .lyr file is a pretty much a file that points to the data, contains all the styling, and other information, you can then just add this file and it will do all the other magic for you. A layer can exist outside your map as a layer file (.lyr). This makes it easy for others to access the layers you’ve built. You can share layers over the network and by e-mail. When users add a layer file to their maps, it will draw exactly as it was saved as long as they can get access to the data referenced by the layer. A common way that users help support this is to use relative paths to each layer’s data source. A question came up on GIS.SE asking Does QGIS have the equivalent of ArcGIS’s Layer (*.LYR) file?. To which the answer was. “Not really”. Which of course was true. At the time. That got me thinking. Why couldn’t we have a feature like this? It would be handy to have as it would let you create layer shortcuts and the ability to a load layers quickly from a single place without worrying about were the data comes from. The XML that we need to recreate the layer on project load was already stored in the project file under the maplayer node. It already has everything we need we can just write that out to disk and create a new file type. After some digging into the API I found QgsMapLayer::writeLayerXML() and Bingo! .qlr was born. Because I personally, and some others I talked to, didn’t really like just “Save as Layer File..” as it sounds a bit vauge, we picked “QGIS Layer Definition file”. A QGIS Layer Deinition File is simply the XML maplayer node, with the id removed, saved to disk as a .qlr format. 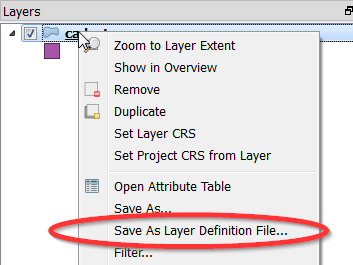 Saving one is as simple as Right Click Layer -> Save As Layer Definition File.. The layer file will store any of the styles, labels, edit widgets, etc, that you have defined for that layer so it’s just a matter of adding the file and you are good to go. Like I said at the start it’s simply the XML maplayer node, so if you move the data or want to change the datasource just open the file in a text editor and change it. This will work with any layer supported in QGIS, expect special plugin layers. I will add loading from the browser dock before the release aswell once I get some time. Can we get it in an older QGIS version? All the methods that I used for this feature are exposed to the Python API. Once I get some free time I plan on making a plugin that is aimed at QGIS <2.3 to give those users the same feature. Keep an eye out for it in the plugin installer.